Up until now, the mentality of Dark Horse’s Terminator tie-ins have almost exclusively focused on expanding the universe with new characters, new situations and new settings. They’ve added layers to the franchise, but the disconnect between those elaborations and the events of the movies themselves has been tough to move past. 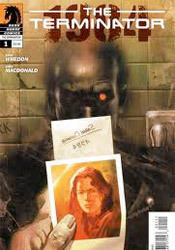 Fleeting appearances from John Connor, infrequent references to the films’ timelines and entirely original casts of characters have distanced the comic book continuity from the primary plot that’s at the wheel of the movie franchise, which has likely turned off many potential casual readers. With Terminator 1984, the publisher tries a new strategy: broaden and enrich the events of the catalyzing first film in the series with the story of several concurrent, intertwining threads. Terminator fans are often afforded a unique perspective of the film’s events. We know Sarah Connor’s not out of her mind in the second film, for example, when doctors in the mental hospital patronize her for believing so passionately in the idea of a time-skipping robot assassin. We hold our breath, waiting for the moment those pompous docs come face to face with the real thing, never considering the standpoint of the few elite officials further behind the scenes, chilled by the similarities between her statements and the project they just green lit in R&D. That’s an angle we’re finally allowed to enjoy in the opening issue of this mini-series, as a roomful of decorated military men fret over the captive testimony of Kyle Reese, the man John Connor sent back to protect his mother in the first movie. The moment is rewarding – finally, somebody in charge is using their brain – and opens a broad range of intriguing new questions. How do they react to this revelation? How does it affect or alter their plans? How much of a self-fulfilling prophecy is this horrible, machine-dominated future? Balancing those familiar moments is an original side story, following another soldier from the future who’s leapt back in time to intercept Kyle and subtly alter his historic path. Interestingly enough, it’s this unknown face who adds the most depth to the story, as he absorbs the mundanities of everyday life through unfamiliar eyes. His childlike reaction to the abundance of food and the crowds of people in broad daylight gives the dark future he calls home an even more sinister shade. It’s great storytelling with a noticeable, appropriate shortage of dialog. Andy Macdonald’s artwork is similarly reader-friendly. His work is weighty and solid, grounded and restrained but spectacular when it needs to be. He paces himself, giving the majority of the issue an unconcerned, almost casual appearance, before ramping up the electricity on the few panels of wild, chaotic action. The story plays out beautifully across his expertly timed panelwork, and while none of the cast is a perfect duplicate of their on-screen counterpart, they remain perfectly recognizable. Besides, this is a story that depends more on reenacted plot points to familiarize its readers than perfect visual accuracy. Dark Horse’s latest take on the Terminator franchise gives every indication it’ll also be their finest. Tying the narrative to a specific, familiar period of time in the saga’s mythos was a fine touch that freed the original storyline to focus more on the details and less on establishing itself in-continuity. It’s a finely imagined addition to fondly remembered territory that both emboldens and respectfully enhances the original. Buy it.